It's August. For ultra trail runners, it means only one thing: it's UTMB-time. 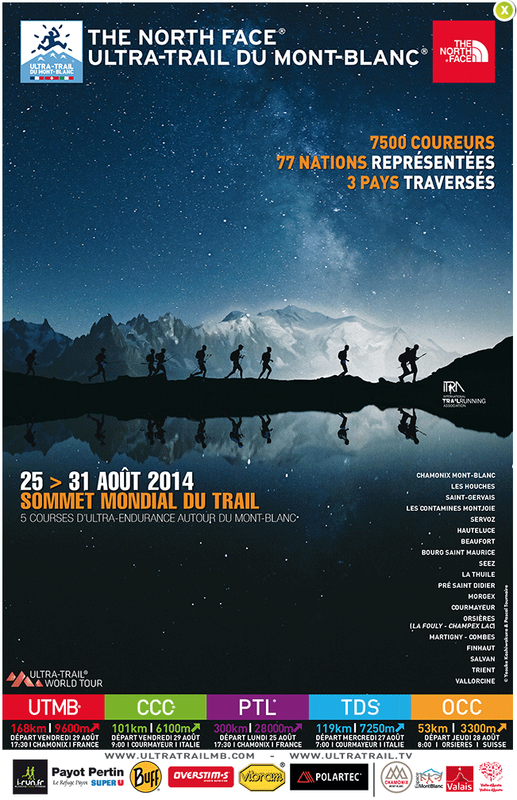 The legendary Ultra-Trail du Mont-Blanc is the biggest and best-organised mountain ultra trail event. With 7,273 runners participating in five ultra races (PTL, UTMB, TDS, CCC, OCC) it's the de facto World Championships. There are other races that are perhaps tougher, older and more prestigious, but they tend to be relatively small and low-key events. For example, Hardrock 100 has only 140 runners struggling to find their way on a largely unmarked course. There is only one Mont Blanc, and it's unique. This year the list of favorites for the 168km (104 miles) UTMB looks very interesting. Having witnessed the winning performances of Anton Krupicka and Rory Bosio in 119km Lavaredo Ultra Trail 2014, my money is on them - assuming they will be healthy at the end of the month. However it's worth noting that their competition will be extremely tough. For men the list is ultra long: Timothy Olson, Francois D'Haene, Miguel Heras, etc. For women the list is more compact, as about 90% of participants are men. Nuria Picas is always a fierce competitor. In addition, 5-Time UTMB Champion Lizzy Hawker will be back in Chamonix! Even Finland's Fritjof Fagerlund (who lives in Sweden) is listed. There will be 34 Finnish runners in 2014 races: 12 in TDS, 8 in OCC, 7 in UTMB, 5 in CCC and 2 in PTL. It should be noted that while officially PTL is not a race, the top teams tend to fight pretty hard for a podium finish. The Finnish team has placed 2nd, 1st and 2nd in the past three years. This year the course (which changes every year, but always goes around Mont Blanc) is the longest (306km) with more elevation gain (+28,000m) than ever. It's possible our Team Rumue will be the first in Chamonix. I'm proud to be one of 2014 UTMB participants. I did CCC in 2012, and this year I won the jackpot - I'll be one of the 2300 UTMB starters in Chamonix at 5:30pm on Friday, August 29th. On the last Sunday of this month we will know the results. My bib is 549 - wish me luck, I probably need it! The biggest question mark will be once again the infamously unstable Mont Blanc weather. Not only is Mont Blanc the highest peak in the Alps, it also boasts the most challenging weather. And those conditions can change faster than you can say DNF. Two years ago I experienced the full force of the elements in CCC, when we were told to wear four layers of clothing. I did as ordered and put on a technical t-shirt, a long-sleeve warm shirt, a fleece and a full rain suit with a hat and double gloves, but still managed to feel cold at the highest passes. Only the hooded plastic poncho I happened to carry in my backpack saved me - my extra fifth layer. The list of 'obligatory material' below should be taken seriously. At least I will. The organisers will most probably check you have everything at the bib pick-up. They might also ask you to show a random item during the race. I won't risk anything: I will carry every single thing exactly as required, all the way. 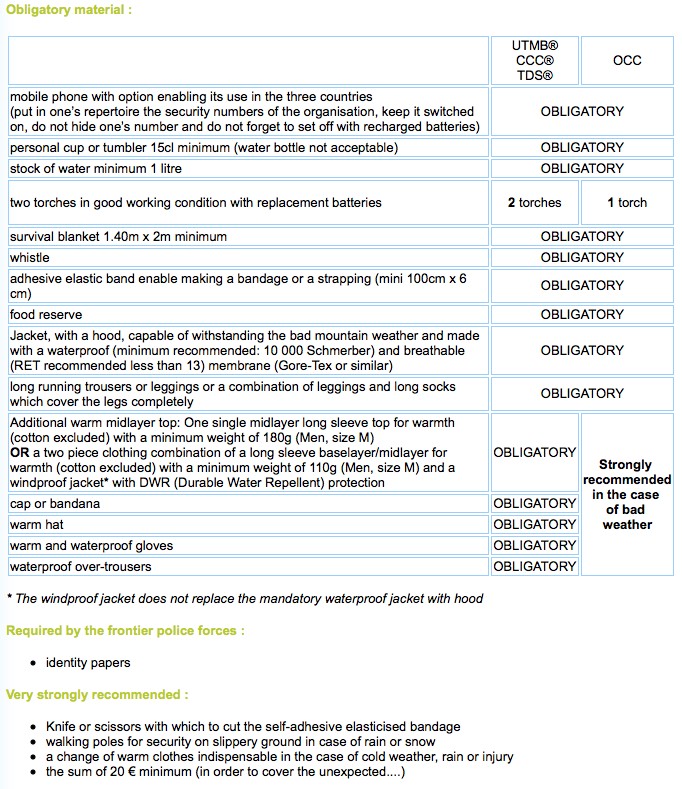 I don't want to be disqualified at an aid station because my Salomon Soft Cup is 125ml, and not 15cl as required. I will be a good boy and have a 150ml cup. About the poles I'd say: yes, I'll carry them and use them most of the time. They are a huge advantage and legal, so why not? BUT: be careful not to hurt/annoy the people around you, and don't wear the hand straps in steep descents in case you lose your balance. BD Ultra Distance poles are a popular choice, but take care or they might get broken. Especially if you are at all like me. Finally I'd like to take this opportunity to mention that I feel a deep respect for all the fabulous race volunteers. It might be a good idea to smile and thank them, although you might be feeling dead by the time. A few kind words or a bad joke (preferably attempting to say it in their language for extra fun) never hurt anyone. At the end of the day, it doesn't really matter if you finish in 1000th place or whatever your goal is. But if you can leave a thousand volunteers along the way feeling a bit happier - now that's an achievement. Ok that's all folks. Let's have the most beautiful adventure ever! See you at UTMB 2014! Hi, this is really exiting. I really look forward to seeing your run. Judging the calendar, looks like you have couple more loooong runs and then taper. Just comment on US runners: Tim Olson has to be hungry for a great performance after unsuccessful Hard Rock. Also Hal Koerner is always someone to watch for. He does not run lot of races, but when he does and everything goes well, he is in podium. Thanks Risto! Between Eiger Ultra Trail and UTMB I plan a 2 weeks recovery, then 2 weeks of long training runs, and the last 2 weeks tapering. Yes I'm a big fan of both Tim and Hal. It'll be interesting to see how Tim will bounce back after HR100. I have to say I don't miss getting ready for UTMB..all the equipment, the looming weather patterns...it makes me cringe looking back at myself backsliding down the side of that mountain in mud and rain. But that one moment, drinking that beer at the finish (that you gave me) while I sat with my daughters, oh it made it all so worth it. Good luck out there and stay safe Trail Plodder!